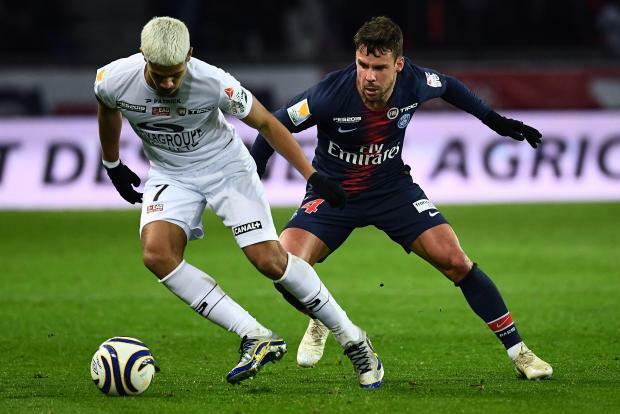 Guingamp's French midfielder Ludovic Blas (L) vies for the ball with Paris Saint-Germain's Spanish defender Juan Bernat. Just look what it means to Guingamp after they beat PSG to reach the Coupe de la Ligue semi-finals ???? Paris Saint-Germain saw their 43-match winning run in domestic cup competitions come to an end as Thomas Tuchel's men suffered a shock 2-1 home defeat by Ligue 1 bottom club Guingamp in the French League Cup quarter-finals on Wednesday. The visitors were awarded three penalties at the Parc des Princes in a dramatic second half, as PSG failed in their bid for a sixth straight League Cup title. It was only a second defeat in all competitions this season for the capital club, after a 3-2 loss to Liverpool at Anfield in the Champions League last September. Guingamp, who have won just two league games all season, join Monaco, Strasbourg and Bordeaux in the semi-finals. "We came here to win and we know it's very difficult here," said Marcus Thuram, the son of 1998 World Cup winner Lilian Thuram, who scored the winner. "We know that in the Cup anything can happen... We knew how to hinder PSG." Neymar broke the deadlock in the 63rd minute after Thuram missed from the spot, but Guingamp rallied, with Thuram's successful injury-time penalty snatching victory with a shootout looming. "We played with too much confidence, we were not hungry enough to finish the match," admitted PSG coach Thomas Tuchel. "It's very hard to lose with three penalties. I was angry with the second one, I can see the VAR 100 times, it's not a penalty." Tuchel named a strong starting XI including Kylian Mbappe, Neymar and Angel Di Maria, but a drab first half in the capital failed to produce a single shot on target from either side. The reigning French champions had extended their cup winning streak at the weekend against fifth-tier Pontivy, but Guingamp were awarded a penalty on the hour mark when Ludovic Blas was tripped by PSG full-back Thomas Meunier. Forward Thuram blazed his effort from 12 yards well over the top of the crossbar, and it appeared as though the opportunity of an upset had passed Guingamp by when Neymar headed home a Meunier cross less than two minutes later. But the away side managed to stay in the game and were handed another penalty nine minutes from time when Marcus Coco was bundled over by Juan Bernat, and Congolese international Yeni Ngbakoto made no mistake after a lengthy VAR delay. With the game set for penalties after 90 minutes, Guingamp landed a decisive blow on the counter-attack, as Thilo Kehrer fouled Thuram, and this time the 21-year-old squeezed the ball under the diving Alphonse Areola in the PSG net.